“Considering that seismic surveys put hundreds of personnel into the forest to carry out noisy activities in a grid pattern every few hundred meters across the entire landscape, we can say that at least 80 percent of the region actually suffers some level of impact,” Swing said. Critics said that Ecuador could potentially reduce such destruction if it stuck to an inland-offshore oil development model, which would not allow any additional road building to the new oil platforms but instead use helicopters and river transport to reach the well heads. The inland-offshore model – which basically treats the oil platforms as if they are in the ocean – has been in use in some project in deep rainforests such as the Camisea natural gas project in Peru and the Urucú gas project in Brazil. Oritz added that such a course would require “full transparency,” but that to date has not happened. But the inland, offshore model is considerably more expensive than more traditional, road-dependent models and several experts interviewed believed that Petroamazonas was making no effort to maintain ITT blocks as a strict inland offshore project. 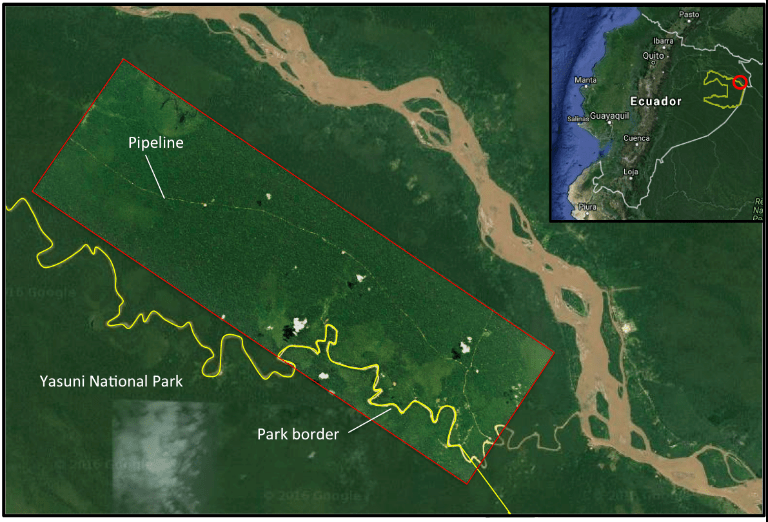 Skepticism is further driven by the fact that the Ecuadorian government allowed Petroamazonas to build a massive road into the adjacent Block 31 even though it had pledged no oil roads there. The government refers to this road as an “ecological trail,” but it’s a trail that can fit several large bulldozers side-by-side. Even an inland, offshore operation can have significant impact, according to Koenig. He points to Block 10 as an example where Petrozamazonas employed helicopters and a monorail to bring materials in-and-out of drilling sites. Eventually, colonists came anyway, following the monorail that had been cut through the jungle. Perhaps the most damning criticism of the oil operations – even an offshore inland model ­– is that it further infringes on land held by indigenous tribes that have chosen to remain isolated from the outside world. Petroamazonas push into ITT not only potentially puts at risk its workers, but also the Tagaeri-Taromenane. The tribes, which may only number a few dozen in total, are hugely vulnerable to common disease with which they have had little contact and therefore developed little immunity. Mortality rates after contact have been known to wipe out half of whole communities and experts fear that pushing oil deeper into Yasuni could result in the total extinction of these two tribes. “Those are more dangerous than environmental ones,” he added. Research has shown that this area of the world has the highest known diversity of mammals, birds, amphibians and vascular plants. Indeed, it’s often pointed out that a single hectare in Yasuni National Park contains more tree species than are native to the U.S. and Canada combined. In a bid to protect ITT, Ecuador proposed a radical idea in 2007. It would forgo drilling in Yasuni’s ITT block (though it continued to drill across much of the rest of the park) if the international community pledged $3.6 billion (about half of the then expected revenue) to a United Nations Development Program-run fund. The ITT Initiative, as it was called, was billed as a way to protect biodiversity, combat climate change and safeguard indigenous populations. But in 2013, Ecuador abandoned the program citing that it had only raised $330 million or nine percent of the total. In Ecuador’s case, Swing said the country should focus more on developing and promoting eco-tourism instead of exploiting its protected areas. The first wells in the ITT block have been tapped and started producing. Many more are expected to follow.